Greetings, forex friend! The U.S. will be releasing the latest non-farm payrolls (NFP) report tomorrow at 12:30 pm GMT. There’s therefore a good chance that the Greenback may get a volatility injection. And if you’re planning to trade that top-tier event, and you need a quick rundown of what happened last time, as well as a quick briefing on what’s expected this time, then you better read up on today’s write-up. 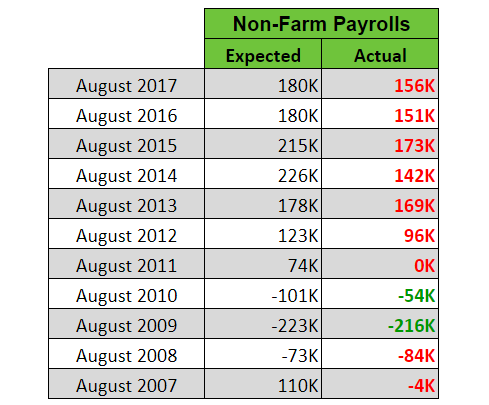 The July NFP report revealed that only 157K non-farm jobs were created in July, missing expectations for a 190K increase. But on a happier note, the reading for June was revised higher from 213K to 248K, while the reading for May was upgraded from 244K to 268K. That means that non-farm payrolls increased by 59K more than originally estimated. All those revisions and the relatively solid jobs growth in July were apparently more than enough to keep up with working age population growth since the jobless rate improved from 4.0% to 3.9% as expected, even though the labor force participation rate held steady at 62.9%. As for wage growth, average hourly earnings increased by 0.3% as expected. However, the previous reading was downgraded from 0.2% to 0.1%, which is rather disappointing. To summarize, the July NFP report revealed that non-farm payrolls missed expectations, so the Greenback slumped as a knee-jerk reaction. The July NFP report was actually a bit mixed, however, so bulls quickly jumped in and tried to push the Greenback higher on most pairs. Fresh sellers would return later, though, thanks to the worse-than-expected reading for ISM’s July non-manufacturing PMI. For this Friday’s NFP report, the consensus among most economists is that 193K non-farm jobs were created in August, a bit more compared to the 157K increase printed in July. Economists also think that the increase in jobs will be enough to lower the jobless rate further from 3.9% to 3.8%. However, there is also a consensus that wage growth decelerated a bit since average hourly earnings are forecasted to only print a 0.2% increase (+0.3% previous). Markit’s manufacturing PMI report found that job creation slowed in August but “remained solid.” Markit didn’t really elaborate on that, however. ISM doesn’t agree with Markit’s findings since the employment sub-index of ISM’s manufacturing PMI report rose by 2 index points to 58.5, which means that employment grew at a faster pace. ISM’s non-manufacturing PMI report goes against Markit’s findings since the employment sub-index improved slightly from 56.1 to 56.7. The ADP report showed that private non-farm jobs only increased by 163K, which is lower than the expected 195K increase, as well as the previous month’s +217K. Well, there is apparently a rather strong tendency for the August reading to be weaker compared to July, which is contrary to the consensus. Economists also apparently have a very strong tendency to overshoot their guesstimates for August non-farm payrolls. And as a result, there are far more downside surprises than upside surprises. As for wage growth, there aren’t really any historical trends for us to exploit. In summary, there is a consensus that jobs growth picked up the pace in August after slowing down previously. And while the available leading indicators are a bit mixed, ISM is the odd one out since the others point more towards a potential slowdown since the ADP report showed that private non-farm payrolls increased at a weaker pace and both of Markit’s services and manufacturing PMI reports found anecdotal evidence of weaker jobs growth. Needless to say, Markit’s finding and the ADP report go against the consensus that jobs growth accelerated. However, they are backed by historical data since there’s a rather strong historical tendency for jobs growth to decelerate in August. Moreover, economists also have historically been too optimistic with their guesstimates, resulting in more downside surprises, which skews probability more towards a downside surprise for jobs growth. As for wage growth, the available leading reports don’t really offer any clues. There are also no meaningful historical patterns for us to exploit. Anyhow, just remember that traders are usually (but not always) focused on non-farm payrolls. And the Greenback’s knee-jerk reaction to the poorer-than-expected reading for the July NFP reading is an example of this. 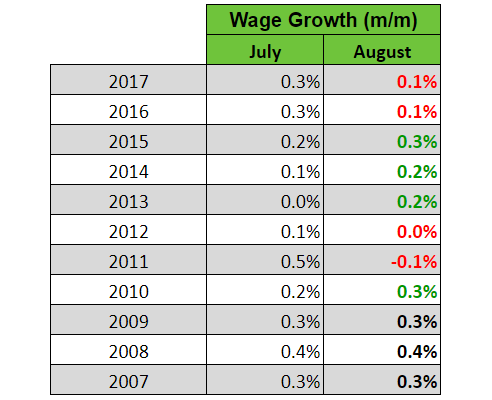 As for follow-through buying or selling, that usually depends on the other labor indicators, with wage growth usually in focus because of its more direct link to rate hike expectations. And all the more so, given that this Friday’s NFP report also happens to be the final NFP report before the September 26 FOMC monetary policy statement. By the way, if news trading ain’t your thing or if high volatility makes you uncomfortable, then just remember that you always have the option to sit on the sidelines and wait for things to settle down.